“Everybody’s out to have a good time, and it’s really about bringing the entire state together,” says Gretchen Lahourcade, San Antonio resident and long-time Fiesta participant. That’s an understatement. The world famous ten day long celebration in April is full of activities…ones that are as grand as they sound. 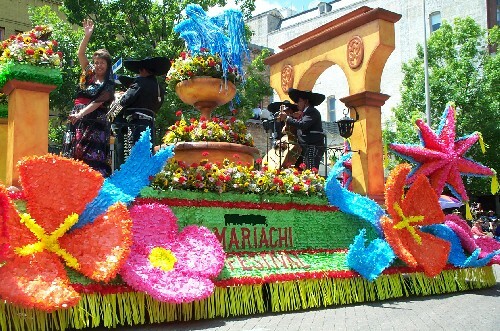 The bacchanal’s major events include the Battle of Flowers Parade, the Fiesta Flambeau Parade, A Night in Old San Antonio, the Queen’s Ball, the Queen’s Garden Party, the Fiesta German, and the Texas Cavalier River Parade. And so many more attractions that draw at least a half a million participants annually – from both residents and visitors to the city. There’s even a royal court that takes three years of preparation. The grandeur is infectious and every attendee can’t help but to dive into the enthusiasm. Think of it as a royal infatuation of Merry Old England meets Texas charm. What started out as an annual ritual of the city’s social elite is really quite inclusive to anyone who wants to participate. Even Fiesta’s illustrious beginnings are regal in nature. 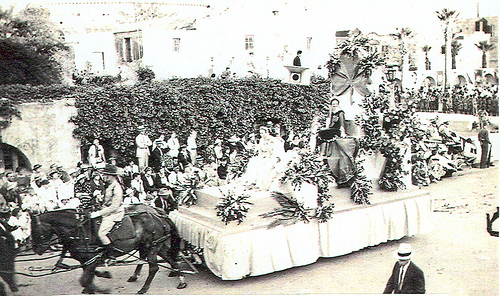 Centuries ago in 1747, the San Antonio area honored the coronation of the Spanish king. In more recent times, with the Battle of the Alamo still fresh in the city’s memory when the celebrations began in 1891, a goal was to preserve the historic mission with badly needed funds or it would be razed. That year, a group of citizens gathered to honor the heroes of both the Alamo and the Battle of San Jacinto with the annual tradition that continues to this day, the Battle of the Flowers parade, based on a similar idea derived from Nice, France. It now ranks second in size to the Tournament of Roses Parade in Pasadena, California. And those beginnings spawned a tradition today that perhaps even the state’s forefathers could never have imagined. The fundraising aspect of Fiesta began then and continues to this day. Sure, the parties and revelry are fun, but the main goal is to raise funds which help so many organizations across the city. To maintain a high level of fundraising, over 100 events dot the city during Fiesta, making it the grandest round of parties in the state that features food, music, sports, pageantry and patriotic observances, exhibits and parades. Non-profit organizations sponsor every activity and the economic impact of the festival is close to $254 million dollars annually. Tens of thousands of residents donate their time to make sure that their civic service balances out the party atmosphere. Perhaps the grandest of all, as well as being the best known part of the festivities, stems from The Order of the Alamo, the men’s social organization that selects the queen and her court. It’s one of the highest honors that San Antonio society can impart. Yes, most of the queens come from the inner sanctum of old aristocracy, but keep in mind that heritage, not money is the decisive factor in the culmination of the Queen and her court. Typically, the queen’s court includes a princess, 12 local duchesses and 12 from out of town, and they’re all featured in the coronation and local parades. Serving only one year, each court takes about three years of planning. From original concept sketch to the final creation, the elaborate gowns and capes prove that the expense and time commitment are worth it. The stunning, bejeweled gowns are laden with each year’s over-the-top fantasy theme, while continuing to dazzle and surpass even the previous year’s efforts. The challenge is for the dresses to emulate the year’s chosen theme. For instance, in 1983, the theme was “The Court of the Treasures of Africa” with gowns representing the Great Migration, Ceremonial Mask, Stone Age Art and Mount Kilimanjaro, to name a few. 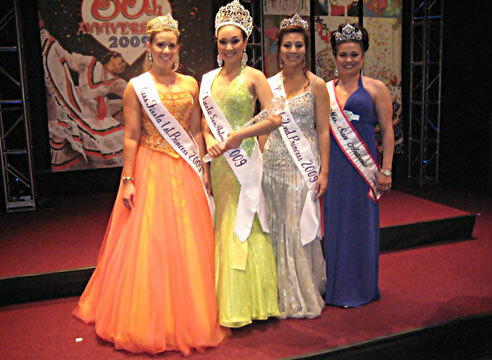 Recently, in 2003, the theme was “The Court of the Royal Crowned Jewels” which showcased all the great queens in history. Presided over by the Mistress of the Robes that year, Gretchen Lahourcade spent thousands of hours supervising the robes such as the Imperial Hapsburgs, Celtic Legend, Britannic Majesty, and the Napoleonic Empire, as an example. Lahourcade says, “It was one of the best years of my life, but there were many sleepless nights, too, in the three year preparation process for my court.” The coronation ceremonies are also elaborate in scope with the set design and music that meticulously match each year’s theme. After the official round of the season’s festivities, the gowns are loaned to the Witte Museum where visitors can get a closer look at the year’s worth of efforts that went into designing and crafting the hand-made beaded creations. After the display, the owners may do what they want with them. It’s well-known that on prominent Texas family keeps their duchess gowns displayed in their pool house. 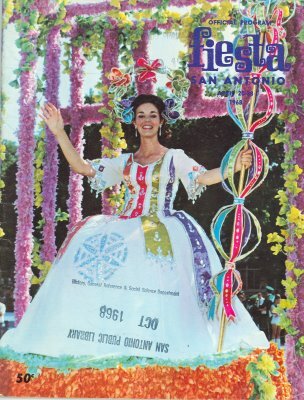 Other Fiesta royalty who have a presence, although more recent in scope, are Miss Fiesta, The Queen of Soul that represents the African American community, Miss San Antonio, The Charro Queen, The Reina de la Feria de las Flores, and the Fiesta Teen Queen. And each one is a reigning beauty in her own right. Henry R. Munoz, III, a former El Rey Feo, told me, “The title is ‘The People's King’ and is an icon of inclusiveness and opportunity that very simply says ‘Fiesta is for everyone.’ Through this tradition millions of dollars have been raised, to educate thousands of young people who are making a difference for the future our state.” In essence, all of Fiesta is about the community of sharing and caring. And having fun. The tradition of obtaining and exchanging badges is one of the most fun components of the celebration. All the official activities have their specially designed badge, so that a sash of several dozen truly becomes a badge of honor for each willing merrymaker. To further understand the scope of the celebration, attending any of the nearly one hundred events is recommended, but there are a few that stand apart, all steeped in a tradition that makes ever year’s Fiesta feel as fresh as the gardenias on a parade float. The Battle of Flowers Parade has dozens upon dozens of floral-laden floats to captivate any onlooker with a sense of awe. Planned and directed completely by women, these ladies work hard to make sure the parade theme is not only respected, but also breathtakingly represented. The Fiesta Flambeau Parade, founded in 1948, is different in scope. It encourages surrounding communities to enter floats from their own local festivals. The River Parade, which marks the official arrival to Fiesta of King Antonio, it’s a spectacle to see the floats navigate the narrow barge. Nearly a quarter of a million people line the banks to see the magic. A Night in Old San Antonio, sponsored by the San Antonio Conservation Society, works to save local buildings and maintain the city’s heritage with its nocturnal celebration of food and frolic. Lest the ceremonious side of Fiesta be taken too seriously, you can count on Cornyation, a raucous, several night long show that lampoons San Antonio headlines and personalities. Any insider can tell you that tortillas irreverently thrown on stage in a gesture of solidarity with the humor is a high point of the performance. The local schools and colleges get involved, too. St. Mary’s Oyster Bake is a tradition of live music and the consumption of over 100,000 oysters. There are also events as varied as the Women’s Fiesta Soccer Tournament to Hermann’s Happiness, a celebration of indigenous German food and culture. The Fiesta San Antonio Commission governs this yearly endeavor, which is financially self-supporting. It’s important to note that Fiesta receives no direct of city funding, relying instead on membership dues, corporate partnerships and licensed merchandising sales. But it’s the combined millions of hours of heart and soul that put on this elaborate celebration that does so much for so many, rightfully placing the legends of Fiesta at the top of list of what best represents the spirit of Texas.